Pizza was on my mind. I finally had a day off and yet the forecast warned of heavy snowfall as I contemplated making the 2-hour drive into town for a little slice of pepperoni. Working in the middle of nowhere makes a mind go crazy, so I decided to hit the road anyway. I grew up in Minnesota, what’s a little snow? So I thought. Halfway to my destination the weather took an ugly turn. I was crawling through a blizzard at under 5 mph, praying that I would make it to civilization. My hardy Subaru Forester continued to inch through the mass of white in front of me, until it happened. Around the corner I make out a red car … driving down the middle of the road. I creep slowly to the right edge and like slow-moving molasses, my right wheel slides into the ditch and a pure white blanket of snow envelops the whole front half of my little car. I’m mad, I’m embarrassed, and I’m scared. Now what? Not five minutes later, an angel in a truck rolls around the corner. 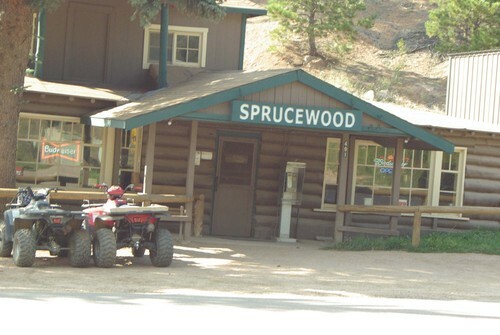 George Melvin, the owner of the Sprucewood Inn around the corner, hooks my car up with his truck and tows me out, just like that. I spend the next few hours in the sanctuary of his quaint little inn warming my toes. George chats about his life, his wife struggling with cancer, and the weather outside as I stuff myself with, thank the Lord, PIZZA. It was in those moments at Sprucewood that I got to know a truly caring man. If it wasn’t for George taking the time to help a girl in the ditch, I’d probably be out walking in the snow. Thanks for the pizza, George. It looks heavenly. My nickname is Pizza because I love it so much. But, I’m convinced Pizza solves all problems, especially the cold. Last summer, I remember how cold it was in San Francisco and my whole family turned to pizza for comfort.